When art specialist Giles Peppiatt was asked to appraise a painting at the home of a family in London late last year, he didn't expect to find something so extraordinary. Hanging on the wall of the family's sitting room was "Tutu," an iconic Nigerian masterpiece whose whereabouts have been a mystery for decades. "When I wound up at this normal, modest apartment in north London, it was quite a shock," said Peppiatt, director of modern and contemporary African art at Bonhams auction house. "I immediately was as sure as I could be that this was the lost picture that people had been talking about and looking for." Nigerian artist Ben Enwonwu painted the portrait of a young woman named Adetutu Ademiluyi, known as Tutu, in 1974. She was a royal princess of Ife, an ancient city in southwest Nigeria that's considered the ancestral home of the country's second largest ethnic group, the Yoruba. Enwonwu created three versions of "Tutu," and all had been considered lost until Peppiatt's recent discovery. The owners, who have asked to remain anonymous, inherited the painting from their father and "hadn't a clue" it was an original until Peppiatt confirmed its authenticity. "This is probably the most famous painting to come out of Africa," Peppiatt told ABC News in a telephone interview Friday. "People have been referring to it as the 'African Mona Lisa,' and I wouldn't challenge that." 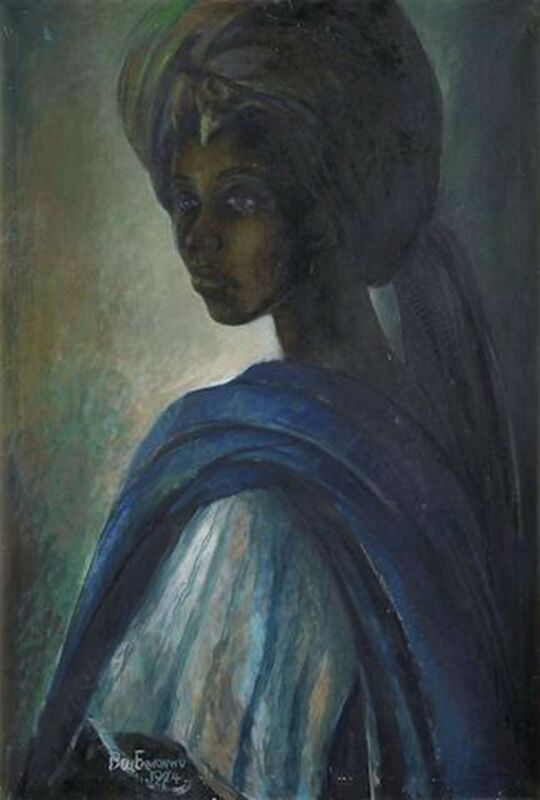 "Tutu," a portrait of the Ife royal princess Adetutu Ademiluyi painted by Nigerian artist Ben Enwonwu in 1974. Enwonwu's depictions of the princess became a symbol of national reconciliation for Nigeria, at a time when the West African nation was still reeling from the civil war between the Nigerian government and the secessionist state of Biafra, which was mostly inhabited by the Igbo ethnic group. Enwonwu, who was Igbo, painted the first "Tutu" portrait in 1973, and it remained in his studio until his death in 1994 before disappearing. The whereabouts of the third portrait is also a mystery. In these paintings, Tutu appears in a regal pose, clad in formal and informal Yoruba attire. "Tutu" will lead Bonhams' "Africa Now" auction in London on Feb. 28. The artwork is expected to fetch as much as 300,000 British pounds, or more than $410,000, which would be a record sum for a modern Nigerian painting. The event will be broadcast live in the Nigerian city of Lagos, and bidders will be able to participate in real time. "It's an enormously important moment for Africa," Peppiatt said.